Many Homes in the Washington DC Metro Area were built prior to 1978. Back in those days, it was a common practice to use lead-based paint materials for both interior and in exterior painting jobs. For many home owners, older houses have a certain charm and attraction because of the architecture. As is the case, there is craftsmanship that cannot be found in newer houses. Lead Paint was also the most durable at the time, and is sometimes found in older buildings. If this sounds like your Home, and has never previously been tested for lead, it is the law for any Contractor to first test the house for lead prior to performing any work. This is how lead gets into the home environment and onto carpets and possibly furniture. When the paint chips or flakes off due to scraping or sanding, lead particles can be released. This is when it can become a health hazard, especially for women who are pregnant and small children. Perhaps some of you have seen the image of a child eating paint chips off of an old door; however, this is not the most common way that children become exposed to lead. Whenever there is any type of construction work going on dealing with lead paint, there will always be lead dust because of the fact that lead paint crumbles very easily. The dust can be stirred into the air when the house is swept or vacuumed and then subsequently inhaled inadvertently. 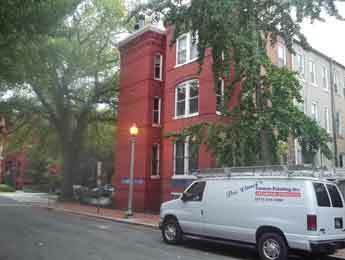 These project photographs are from an exterior project that we recently completed in downtown Washington DC. There were two parts to the project. The first part of the job was the most extensive to remove the previous layer of lead based paint. Once that was completed, the paint application process was routine. Please visit our Pinterest Job Photo Website to view more photographs that illustrate the level of safety requirements involved in the removal of lead based paint. Failure to effectively deal with the risk of lead exposure can cause liability issues related to environmental contamination. You should absolutely discuss your Contractor’s plan and procedures for lead compliance. Davinci’s Painting is EPA Lead Certified, and we are experts in the testing and identification of lead, as well as, lead removal practices. For the health and safety of your family, leave the job of lead abatement and lead paint removal to an EPA Certified Lead Paint Removal Company. There are numerous safety measures that must be followed for both the work environment and the painters themselves. Documentation must also be submitted to the government. 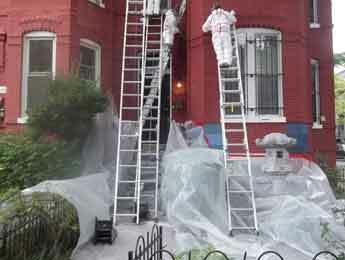 Zero VOC Paints Keep Washington DC Green!